Whether the obligatory resolution was made or not, chances are just about all of us are making an attempt to take a little better care of ourselves after the frantic holidays. Whether that mental promise includes specifics like cutting out sugar or simply eating better in general, one undertaking that will benefit everyone regardless is eating more vegetables. We all know that. The trick is to find veggies that aren't a pain to prepare, won't rot in the fridge, and most of all - are delicious! Those in Western New York who are proponents of trying to eat with the seasons (I say trying because the pickin's get pretty slim around here these next few months! ), will no doubt get pretty cozy with winter squashes and cabbages and root vegetables that store well in cold weather. As much as I enjoy these hearty and rich foods in the winter, sometimes I just crave something green. At times like this, an out of season salad green shipped in thousands of miles from the west coast, only to be doused with dressing so that it tastes like something, just doesn't cut the mustard for me. This is where kale comes in. This cold-weather vegetable has achieved astronomic heights in popularity in the last year, and more and more people are discovering that it can be really a tasty addition to cooking repertoires. Kale is jam-packed with all kinds of good stuff - fiber, vitamins... you name it! From kale chips to kale smoothies, this glamorous green-of-the-moment is irresistibly delicious as well good for you. I definitely dig kale in a crunchy chip or cracker, but even more so, I love kale the old-fashioned way - simmered until tender and uber-nourishing as a side dish or a recipe component. Following is my go-to recipe for simmered kale. There are numerous advantages to preparing kale this way. First of all, it freezes beautifully. If you cook up a couple of bunches of kale at one time, eat what you want and let the remaining kale cool, and portion it into freezer bags and toss the bags in the deep freeze. When you need a healthy side dish fast, pull out a bag, defrost in the microwave or plunk the kale in a saucepan with a splash of water or stock, and cook, covered so that it steams itself defrosted, until the kale is hot. The taste will be virtually indistinguishable from a fresh batch - kale is magic! Kale has a depth of flavor that was overlooked for ages as it simply got shoved on platters as a garnish. In terms of both nutrition and culinary yumminess, it is so much more! The curly kale most commonly available is best when the thick, fibrous stems are removed - just fold the kale leaves in half and pull away the stems with your hands. 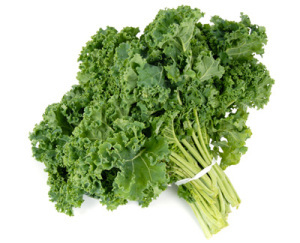 The thinner kale, often called Tuscan or dinosaur kale, is delicate enough to keep the stems on. No matter which brand you choose, rinse the kale, shake off the water, and slice or tear the leaves into 1-2" strips before cooking. On busy nights, this can be a hassle, so that is why I highly recommend cooking lots of it at once and freezing portions for those hectic meal type of evenings. Another advantage to simmering kale is that it is very flexible and adaptable to your recipe needs and desires. Love pork? Add some crisped up bacon or pulled pork at the end of the kale's cooking time. Want to amp up the veggie factor? Saute in a chopped onion and bell pepper. Cooked kale can be swapped for spinach in any spinach-dip-type appetizer with great results. You can also amp up the levels of both healthy and tasty in your soups (like white chili, any bean soup or minestrone) with a batch of this kale. Who says you need to serve the usual chili at your playoff parties?!? Simmered kale is really nice served alongside chicken with some roasted root vegetables - it will make you feel positively virtuous after eating it! A great addition to this meal is rice or cornbread to soak up the delicious juices. After the seasonal gorge-fest, it is nice to know that being good again can be so yummy!